SPI control is provided for pests that are associated primarily with grain and pulse products such as wheat, barley, flour, lentils, bread, cakes, biscuits, porridge oats, semolina and cornmeal but may even infest such unlikely products as curry powder. The most common stored product moths that require SPI control include the Flour Moth, Warehouse Moth, White Shouldered House Moth and the Indian Meal Moth. There are also many stored product beetles as mentioned below. Flour mites also come under SPI control although these are not insects and you cannot even see them with the naked eye. 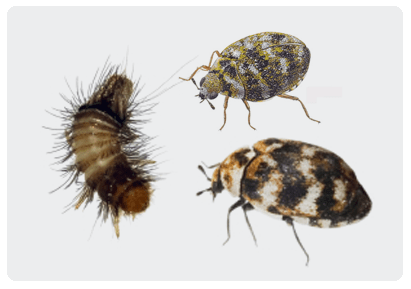 Although SPI pests are most likely to infest cardboard boxes, packets or sacks of food that have already been opened there are many larvae that can chew their way through this packaging or find an opening into non air tight plastic containers or cardboard boxes. Usually, the first sign of a stored product insect problem is the appearance of small moths flying around a kitchen or food production area. In houses it is often the sight of moth larvae crawling up the walls and across the ceiling. If moth larvae are infesting fine powders such as flour or semolina then you may also see the granules sticking together due to the fine moth webbing. A closer inspection will lead to you seeing movement of larvae within the product. With flour mites you would just see the powder moving and nothing else. If you accidentally eat these pests then they are unlikely to make you feel unwell but most people do not like the idea of this and the infested products should be placed in air tight plastic bags and disposed of. 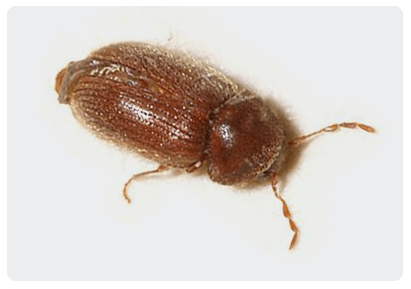 As moths fly around it is very important to distinguish whether you have textile pests or SPI because the SPI control treatment is completely different to textile pest treatments. You should contact a pest control company such as Beaver Pest Control. The solution requires a thorough survey to find the infested produce and this needs to be thrown out. Once the immediate and surrounding area containing food for consumption has been cleared and wiped down then the entire area should be treated with a residual insecticide. In a domestic kitchen one moth treatment is often enough from a pest exterminator and we can usually give you a price over the phone. Call 0208 355 3443 now for free advice. For food production areas and retail outlets we strongly recommend an ongoing contract to try and ensure you do not get SPI moth or SPI beetle infestations in the first place. We would install advance warning systems and be able to advise you on stock rotation and housekeeping. People with infested products at home will often blame the supplier although in most cases it is their own fault. You need to be able to prove due diligence if you are a business premises. Organic companies will have to abide to very strict rules given by the Soil Association in the use of pesticides and therefore you may have to totally rely upon pheromone traps, electric fly killers and good hygiene to control these pests. We will provide a free site visit and quotation and can include Field Biologist reports and quality control assessments if required. 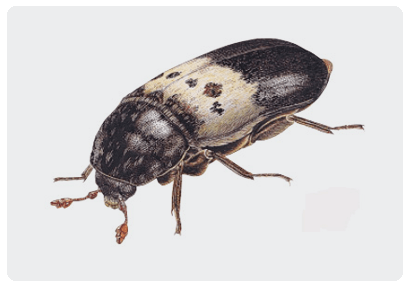 The varied carpet beetle is a 3 mm-long beetle belonging to the family Dermestidae. Is a common pest in many places. It can cause significant damage to harvested grains that are being stored and may drastically decrease yields. The females lay many eggs and the larvae eat the inside of the grain kernels. Larder beetles are infrequent pests of households. Adults and larvae feed on raw skins and hides. 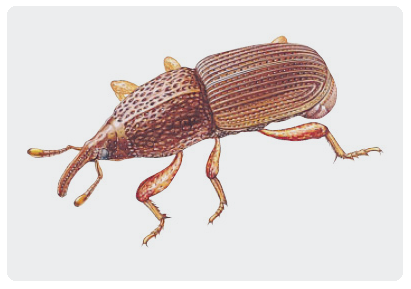 Adult larder beetles are generally 1/3 to 3/8 of an inch long and are dark brown with a broad, pale yellow spotted band across the upper portion of the elytra.